I've been really into the idea of grazing boards lately. Loading up on a little bit of everything so everyone is happy!! Combining the best of both worlds, I used a sampling of traditional Easter candies alongside some savory cheeses & healthy options. One trip down the Easter aisle in Target and you can snag ALL THE THINGS pastel (m&m's, jelly's, etc). From Cadbury Mini Eggs to Annie's Bunny Grahams to the obligatory chocolate bunny AND pink Peeps, it's Easter Candy Heaven over there!! To make the chocolate almond dip even more festive, place it in an egg-shaped dish and make pretty swirls ala a fancy Fabergé egg. Wood Board from Sur La Table. To balance it out, load up healthy options, like fresh fruits and veggies. Bright green grapes, romanesco, snap peas and kiwis are particularly fitting for the holiday. Happy Spring, everyone! Be sure to share your creations with #AintTooProudToCheese. Simply, place the gold coins in the middle and arrange colorful produce across the board to achieve a rainbow effect. 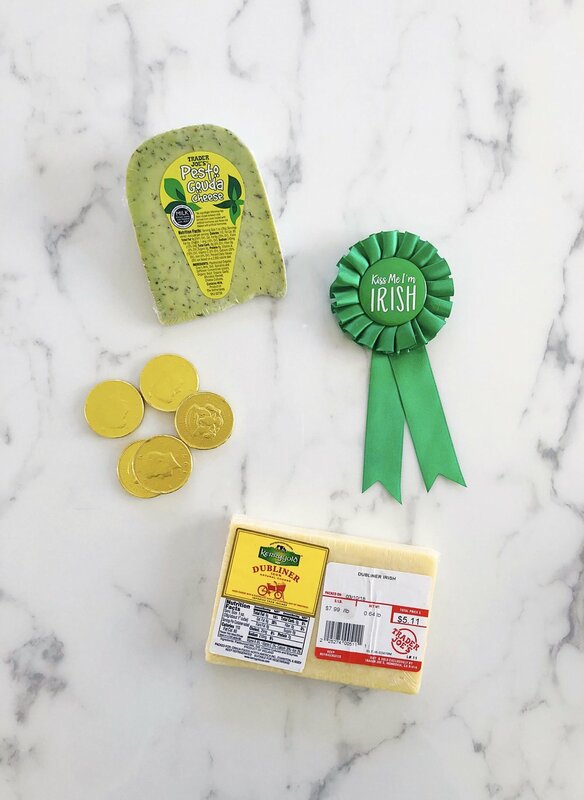 - Kerrygold Dubliner Irish Cheddar is a mainstay on many of my boards for it's buttery sharp taste and affordability. - The Pesto Gouda, while delicious, was chosen mainly for the fun green color. - Gold coins can be found at party stores year-round, but stores like CVS and Rite Aid seem to carry them close to St. Patrick's Day. - The St. Patty's Day flair can be found in the dollar bins at Target for added holiday spirit. - Lastly (not pictured here, but seen in the photos below) I added some red gummy lips as a nod to "Kiss Me, I'm Irish!" In honor of Valentine's Day, I created 3 different boards filled with all the pretty pink, purple and red goodies I could find. 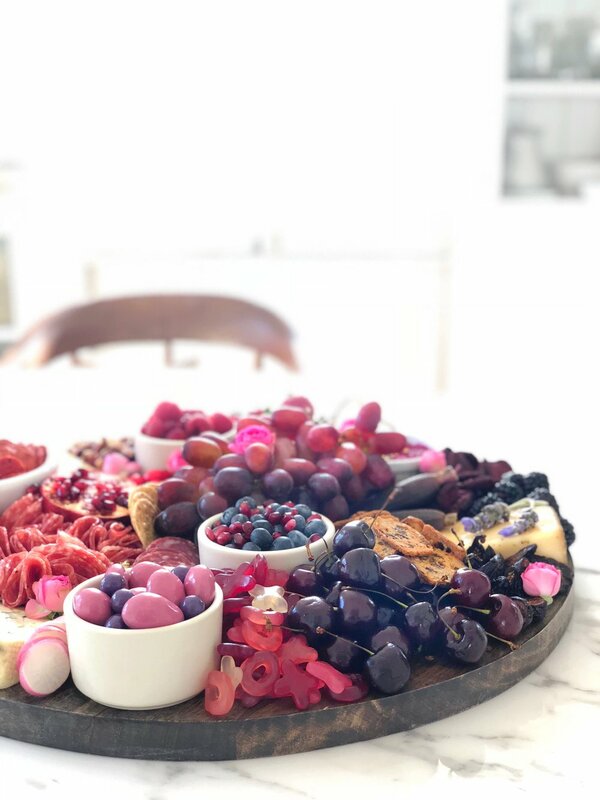 While I only intended to make one board for a friend's annual GALENTINE'S DAY PARTY, I received so many great ideas from the Instagram community, that I had to style a few different options. I'm a big fan of the round board. It's the perfect shape for showcasing a variety of items and textures. You can also add ramekins to keep smaller items in place. You can't go wrong with a tried and true, cutting board. Simple and easy shape to "ombré" the colors from top to bottom. I started with the reds and pinks at top and slowly worked my way into the purples. Most of these items colorful items can be found at Trader Joe's, including the perfectly red beet chips, beet dip and the festive X's and O's. Otherwise, the Easter radishes, cherries, quince paste and lavender were found at Whole Foods. AND, the star of the show, THE CHEESE... is all from Sartori, including their very fitting Merlot BellaVitano®. I started to capture these as a last-minute idea. In the future, I'll look for some better angles and lighting, but in the meantime, they give a little peek into the making-of a cheese board. We've already covered the one-stop cheese board shopping guide. But for the occasions when you have a little more time to gather ingredients, here are a few items that are worth the extra effort. QUINCE PASTE: Traditionally from Spain, this firm, sweet jelly made from the pulp of a quince fruit is the perfect compliment to salty cheeses like manchego. Cut it up in slices (SEE PHOTO AT TOP - it's in the 1 o'clock position on the cheese board). HUMBOLT FOG: A little pricier than the Trader Joe's cheeses, but it's creamy, mild taste is a definite crowd-pleaser. A goat milk cheese made by Cypress Grove, with a distinguishing layer of edible ash, guests go nuts for this one. Tastes particularly great on crackers with honey. (SEE PHOTO AT TOP- it's in the 3 o'clock position). GOOD OLIVES: The Trader Joe's variety I mentioned in the last SHOPPING LIST is great, but if you get the chance to pick from a good olive bar, you're golden. I tend to like Castelvantano Olives (the bright green ones), which are are also available in jars at Whole Foods and many supermarkets. YUM! MIDNIGHT MOON: Another cheese from Cypress Grove. It's nutty and buttery upfont with a slightly sweet finish. Goes great with the fig jam above. I like to cut out the inner part from the rind and crumble it up, then put it back in the shape of the rind for presentation. SEE PHOTO at bottom. There you have it! A few items to build upon your cheese board staples. The below photo has both Midnight Moon (upper left) and Humbolt Fog (right). There was a crazy amount of cheese on that platter for a very special friend's daughter's bday and we managed to eat it all. Those cheeses are THAT GOOD! 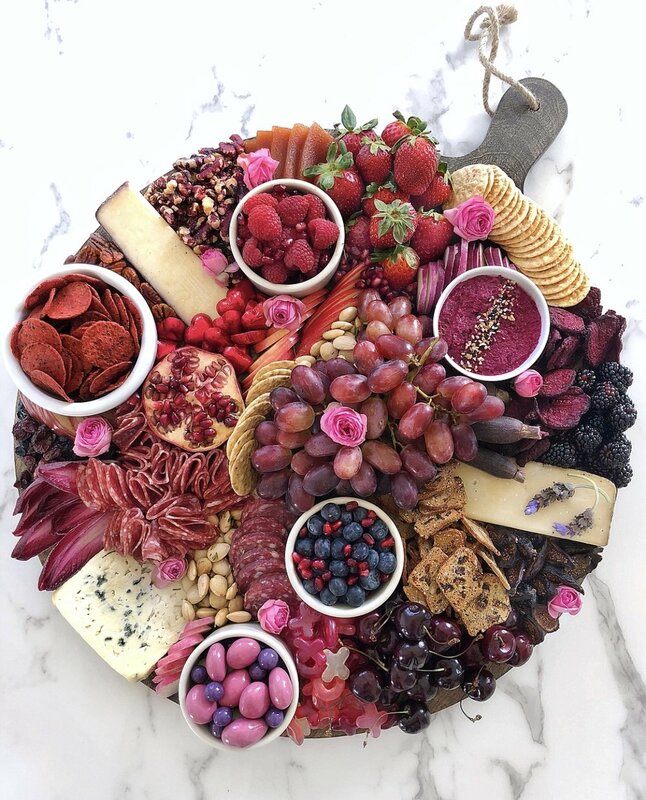 Remember to post your cheese photos, tag @ainttooproudtomeg and use the hashtag #ainttooproudtocheese so I can see all your beautiful creations. They make me SOOOO HAPPY!! Aside from round, I also love the look of a rustic rectangle cutting board or square piece. 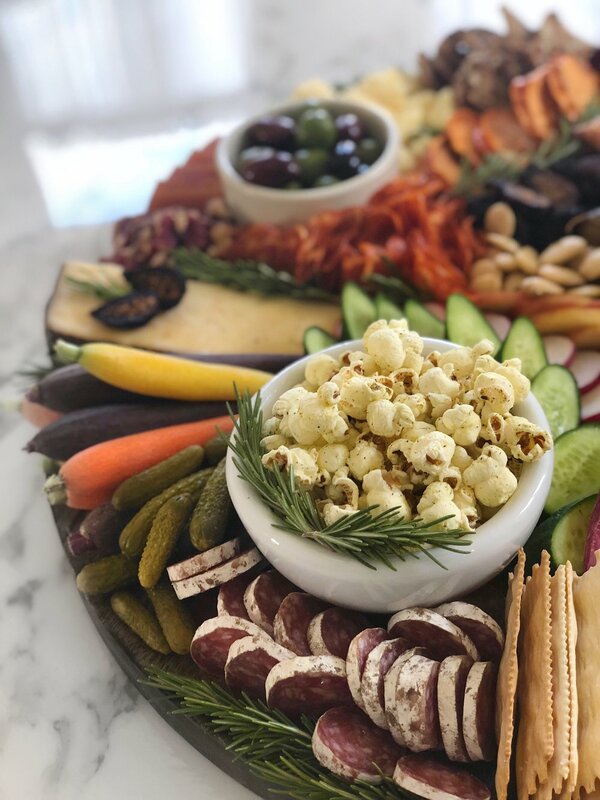 So, in the interest of rounding up the best boards for your holiday gatherings, here are some shoppable boards you can snag in time for your next cheese plate. 2. Boos Cutting Board // Sur La Table // 18in x 12in and 21in x 17in // $99 and $149; I LOVE THESE!! Heavy, great quality. I'll be doing a GIVEAWAY in December so stay tuned. 3. Acacia Wood Cutting Board // Target // 15in // $24.99; From the famous Hearth & Hand Magnolia line. Great size. 4. Cutting Board w/ Handle // Sur La Table // 14in and 19in // $69.95 and $105 // These are a little in between sizes. The 14in for smaller gatherings and the 19in for larger. 5. Lazy Susan // Sur La Table // 18in Heavy // $50. I mean, you can't go wrong with a lazy susan. Just twirl that cheese around so everyone gets a good piece! 6. Professional Style Cutting Board // Target // 24in x 18in // $55.99. Less expensive alternative to the Boos option. 8. Two-Tone Round Inlay Board // Target // 13in round plus handle // $19.99 : Veering towards the smaller end, but fun and cute. 9. Round Footed Tray // Target // 13in Large size // $19.99; Good for smaller gatherings. Another from the Hearth & Hand line. If not for cheese, great styling piece for the kitchen. 10. Cuff Wood Server // CB2 // 13in x 10.75in (wood area) // $29.95. 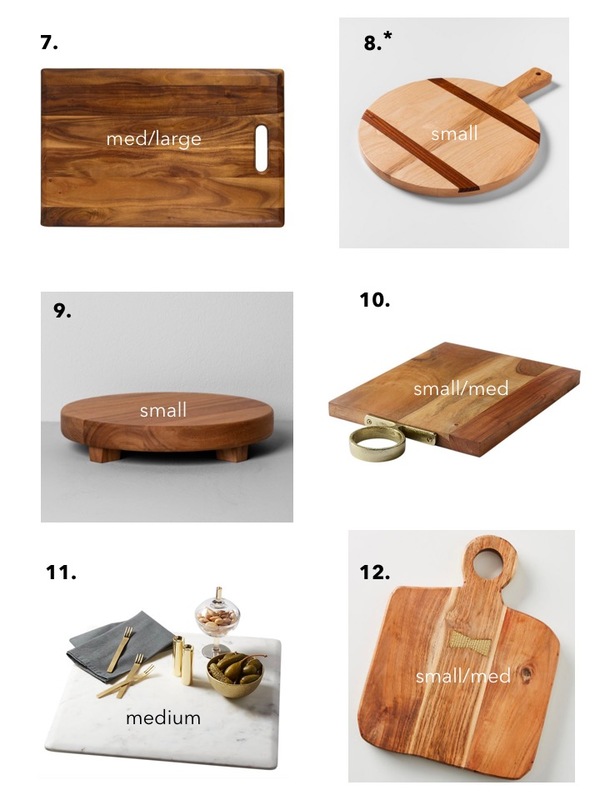 CB2 makes some of my favorite serving platters. The bronze handle ads a nice touch. 11. Marble Lazy Susan // CB2 // 14inx14in // $49.95. Square lazy susan? Sign me up! 12. Woodblock Cheese Board // Anthropologie // 13in x 11.5in // $48. 13. Festive Marble Cheese Board //Anthropologie // 24in x 9in // $118. "Don't mind if I..." throw in a fun option for good measure. 14. Paddle Cutting Board // World Market // 13in x 35in $59.99. 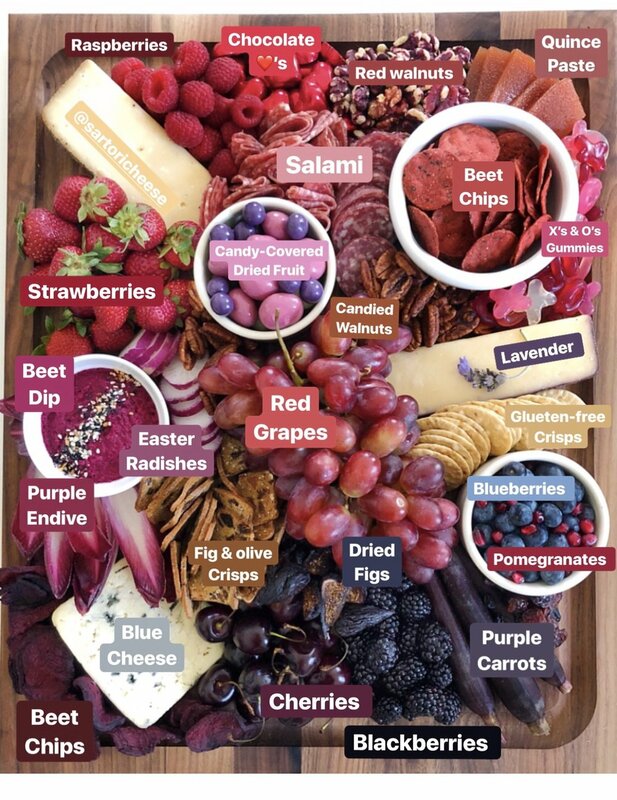 Perfect for a holiday grazing board. Happy cheese-plate making, everyone!! Remember to tag @ainttooproudtomeg in your pics!! Want to steal the show at your next holiday gathering? 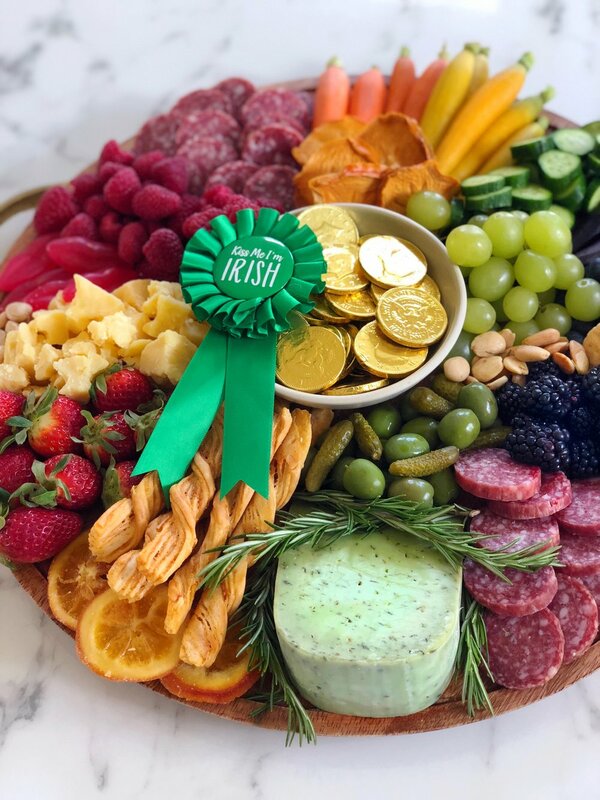 Impress all your friends & family with an epic charcuterie platter! 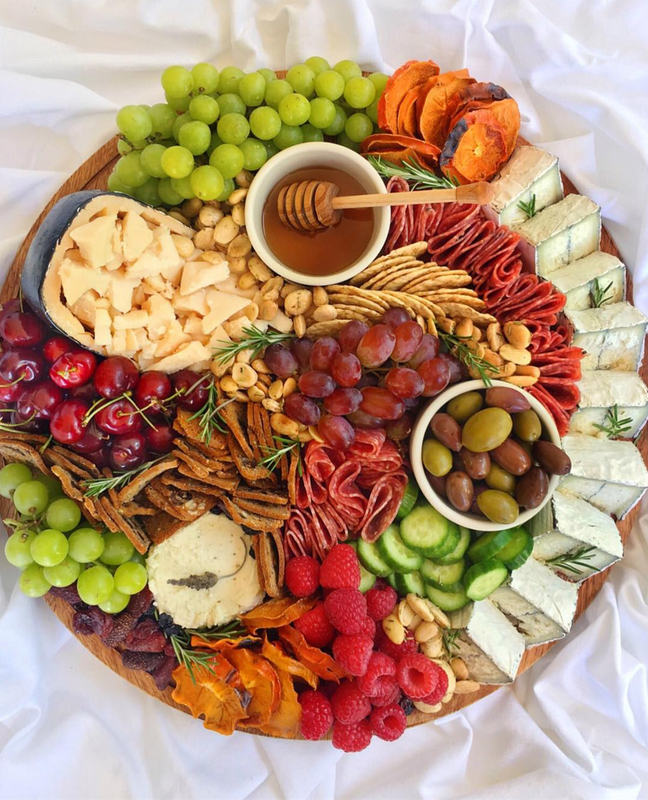 Platters should ideally have 3-4 cheeses; a mix of hard and soft. UNEXPECTED CHEDDAR- The best Cheddar at TJ’s. Sharp, while still being buttery and sweet. Crumble it up and people will go wild over this. An alternative is Kerrygold Dubliner Cheddar, however, it's not been as fresh the last few times I've been to Trader Joes. BRIE- A cheese board staple. Double or Triple cream...the creamier the better. Try to pick one of the more symmetrical slices (for looks) and garnish with a sprig of rosemary on top. OLD AMSTERDAM- My favorite Gouda. Smokey, sweet and great compliment to holiday beers. Make sure you cut off the hard rind (it's thicker than most), then cut into chunks and make “rustic crumbles” from that. 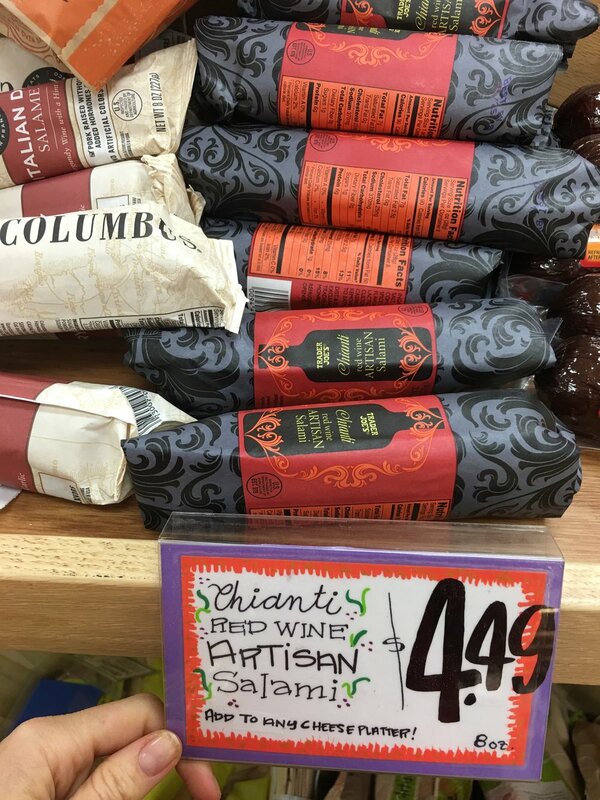 THIN CUT SALAME- These are perfect for creating "salami roses" on your platter. Full tutorial coming soon, but I’m the meantime, fold the salami piece in half and then half again to create a 1/4 circle and wedge a bunch together in between cheese and crackers on your platter. 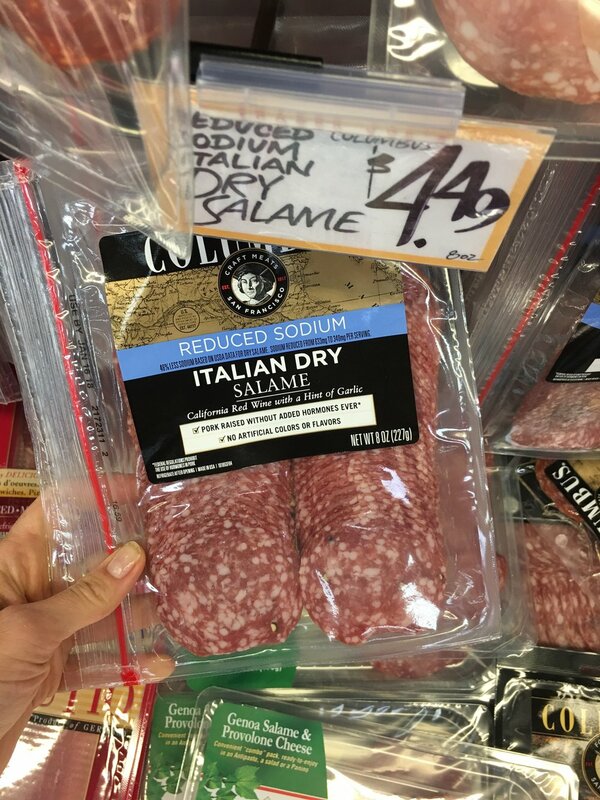 SALAME SECCHI: If the "salami roses" sound like too much work, grab these guys and cut them into slices. They look particularly pretty and rustic on a board. Another option is the ARTISAN SALAMI- Remember to take the casing off before as you cut. NOTE: prosciutto is also a good choice, but I personally think it gets messy and doesn't photograph as well. GRAPES- Cheese board staple. The best are the Thomcord variety, but they've just gone out of season, so pick whatever batch looks best. Green, Red, or the multi-pack from TJ’s. RASPBERRIES- Nice addition for color and texture. Blackberries can work too (but give them a “taste test” to ensure they're not bitter before you buy them (TJ’s blackberries are hit or miss). NOTE: blueberries are pretty small and don't have the same impact on the plate so skip those. Guests always appreciate having some healthy options on the plate. CUCUMBER- Get the Persian variety and slice uniformly. 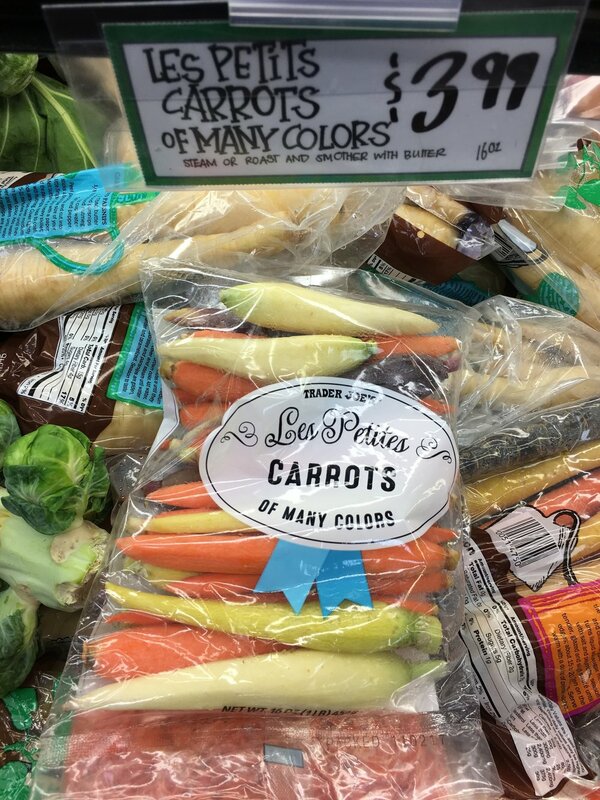 LES PETITES CARROTS- These look much fancier than baby carrots. They're colorful (purple, yellow, white & orange) and people love them. If you don't have access to these, simply cut some regular carrots in think slices. MARCONA ALMONDS WITH ROSEMARY- Guarantee at least one guest will spend the rest of the evening raving about these delicious Spanish-style almonds. TJ's has both the rosemary and truffle variety; guests generally prefer the rosemary. NOTE: Pistachios, Candied Pecans or Walnuts are also a great additions, but these are all you need for a simplified platter. FIG & OLIVE CRISPS- These are the best. For a seasonal twist, they have a pumpkin version. SAVORY THINS- Good gluten-free option for guests. OLIVES- I prefer castelvetrano olives, but those are not available at Trader Joes. This variety is a good secondary option. ROSEMARY- No platter is complete without some greenery for garnish. I use the herb all year long, but it's particularly festive over the holidays. 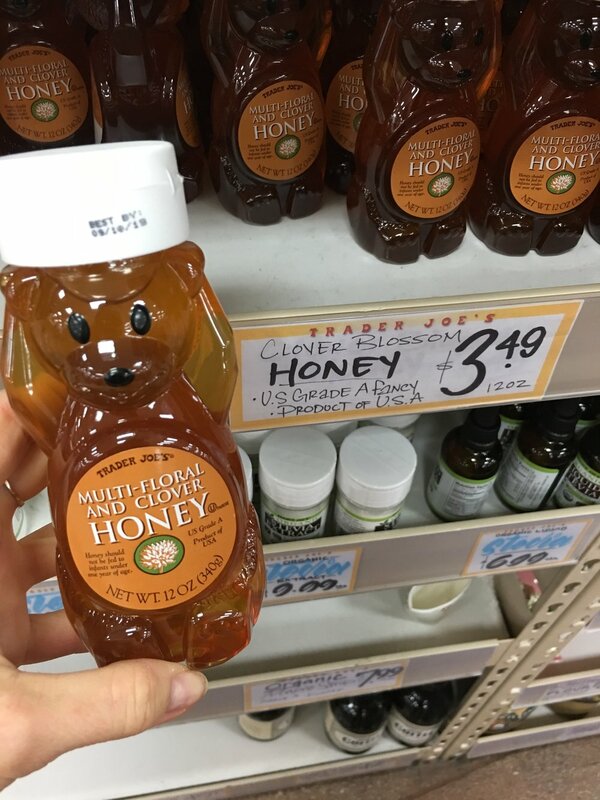 HONEY- perfect sweet compliment to cheese and crackers. Get this awesome honey dipper from Sur La Table and you'll be using the BOOMERANG function on Instagram all night long. DRIED PERSIMMONS: Great for colorful garnish with a unique look and sweet taste. Unfortunately, they are only in stock only half the year in Trader Joe's, so snag them before July comes around. DRIED ORANGE SLICES: as an alternative to the Persimmons (when they go out of stock). Truth be told, they don't taste that great, but they sure look pretty! DRIED BERRY MEDLEY- A sweet treat to sprinkle on the cheese board. The dried strawberries are the crowd favorite!! There you have it!! 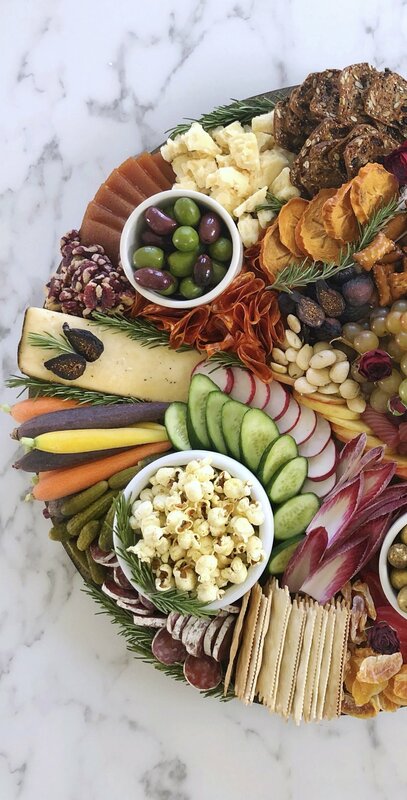 A guide to all the best cheese board fixings from your local Trader Joe's. I'll be back next week with the "Five Cheese Plate Fixins to Splurge On." And check out my "Round Up of The Best Cheese Boards on The Market."